I grew up with an elephant. I always thought it was mine, until my elder sister claimed her right. I must believe her, there are after all reliable witnesses. 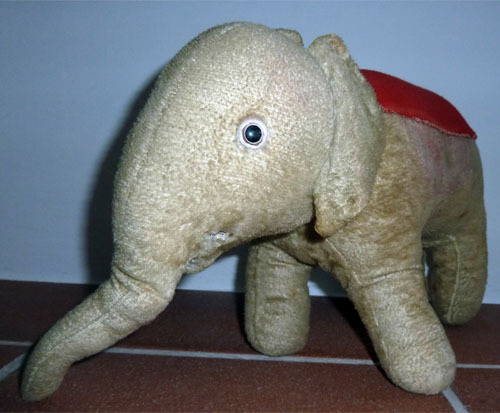 So I grew up with an elephant in the household, a soft toy named Gus Gus, no doubt named by my father who was a maker of names. Gus Gus had a red cloth on top, like a horse cloth, but I shouldn’t say had because he is still very much alive – although he looks like he has been through a lot and the cloth seems to have been shrinking over the years. I was searching for another Gus Gus at Crawford Market in Mumbai last November. I had the idea that such elephants would be plentyful in India, and I magined an elephant with an upgraded red cloth of velvet with sequins and fine embroidery. 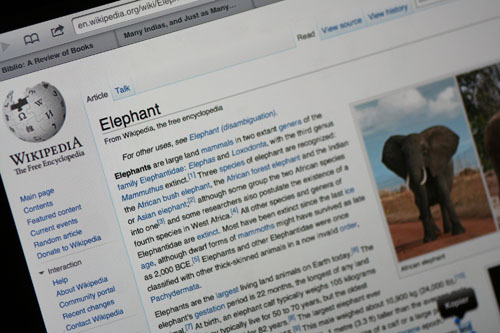 But the elephant I had in mind never materialized, of course…. 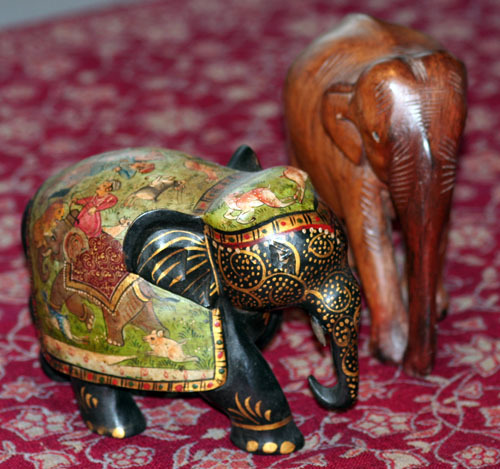 Elephants are supposed to bring luck, and many people collect them – in many varieties. I don’t collect in earnest, but realise I have quite a few…. 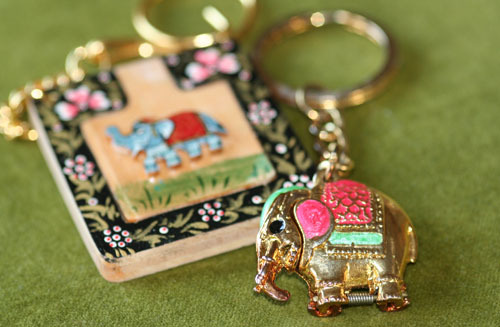 Some smaller things, available everywhere in India – like key rings and book marks, are hard to avoid. 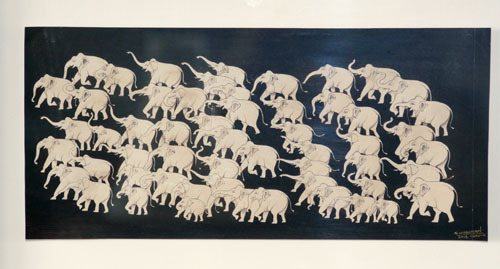 One “elephant piece” that I really appreciate and value is a small miniature drawing bought in Udaipur (state of Rajasthan). Together with a friend I was staying at a small hotel, and the brother of the owner was an artist. Just by chance we ended up in his shop, and the very first thing I saw when I entred through the door was a small piece of art under the glass counter. It was an expensive piece, he had plenty of other elephant-ish items – but this was the one thet stood out and the only one I wanted. So be it….. The artist’s technique was just fantastic, what a gift to be able to draw such extremely fine lines. But like Jairaj told me; – The day my hands start to shiver – I’m out of business. 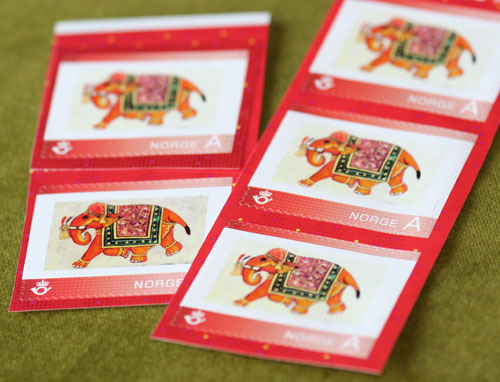 In Norway, it’s possible to create personal stamps, and even personal VISA cards. A chance not to be missed…. 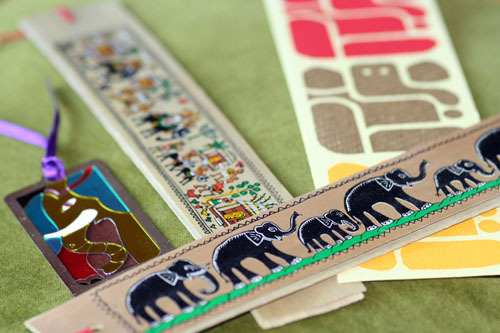 And then you can use the stamps together with some nice, elephant writing paper…. Elephant writing paper from Chimanlals in Mumbai. 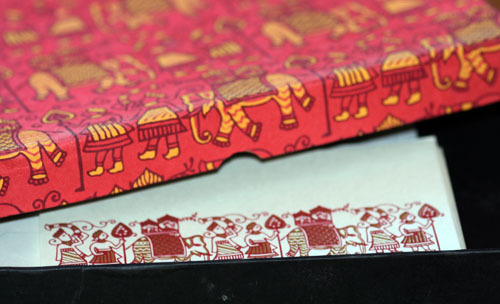 Elephant illustrations can be very ornamental, in gold and red with that typcal ‘touch of India’. But simplified patterns seems to be very modern these days. Like my ‘Apple pouch’ for my Apple remedies; which are the chargers for my Apple devices. When travelling these days one has to carry so many things one even didn’t have to think about ten years ago. 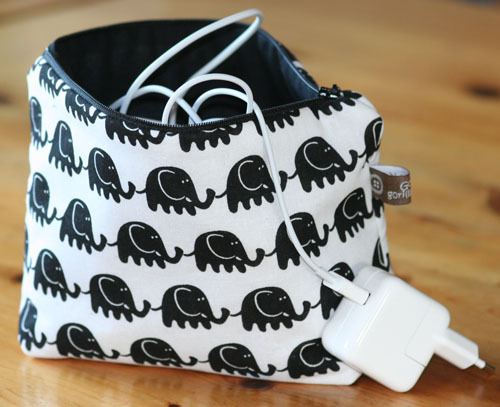 Various chargers are not to be forgotten and better keep them in one place! I try to keep my elephants small, but there are some medium sized… Like the small “silver” family which is guarding the wedding portrait of Ida and Erik. And then there is Prem and Ooty who is sharing our meals with us every day. 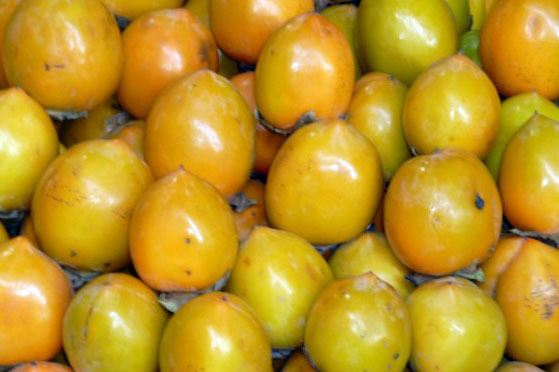 Prem was bought in Dehli, a nice brown specimen from the shops by The Red Fort. It was my good friend Prem Singh who made the bargain… Ooty was bought in…. Ooty (state of Tamil Nadu) last November. A very nice specimen with beautiful ornaments! 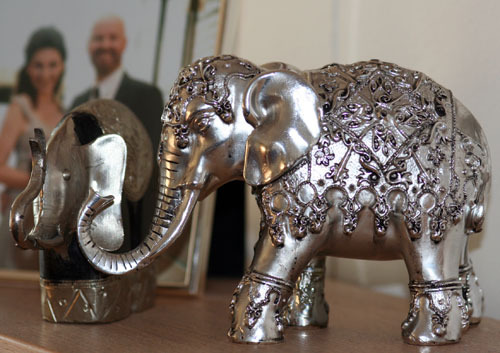 A silver elephant bought at Indiska in Stavanger. The smaller one is a gift from my sister. 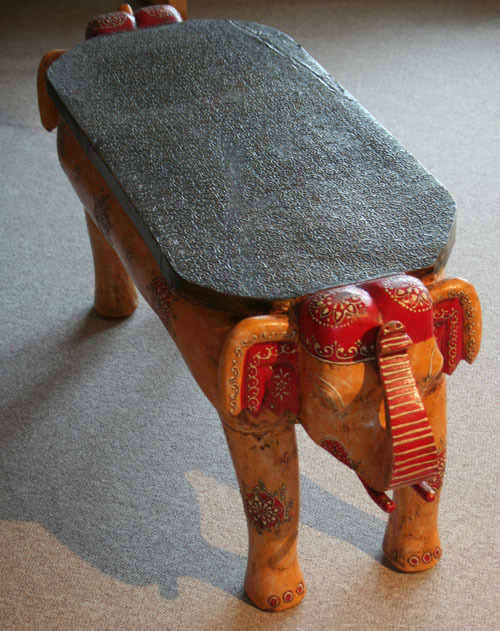 And then there is my elephant table, brought here by UPS, from Mumbai. It didn’t – unfortunately – come without damage, but that’s another story. 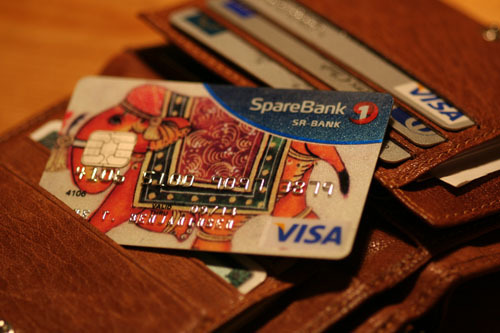 And maybe I paid too much… that’s a story I don’t want to venture into… And it came with some small animals who only a Norwegian winter was able to kill when my elephant table had to spend five days on the veranda – indeed with a blanket…. 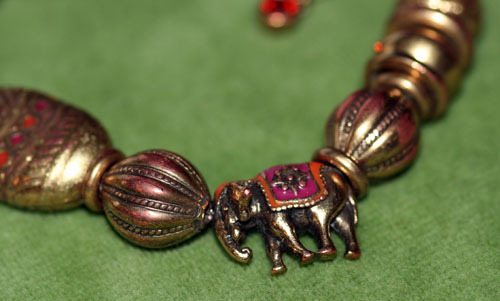 Search Amazon com or uk, search for elephant jewellery and you have work for the next hours for sure. My favourite piece of jewellery, one of them, has a small elephant and I always wear this bracelet when I’m travelling overseas. It’s bought in Norway, it’s a Norwegian brand (Arts & Crafts) although people seem to think that ‘this must be from India’. When I came to Mumbai last November, it was hot. Unusually hot, the locals said. And yes, the thermometer was constantly pushing 40 and the humidity made it almost unbearable to stay outside for a long time. My partner hates shopping, but suddenly he saw shops as an opportunity to cool down…. My good luck! But he also likes to walk, and how would we be able to take brisk walks in the south of Mumbai, when the heat made you feel dizzy just after one block. 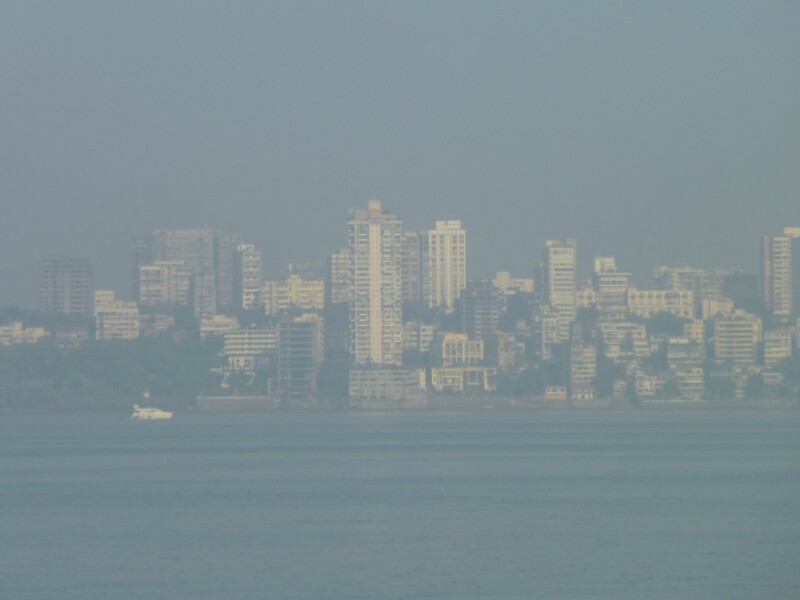 Morning haze, as seen from Marine Drive. The solution was not hard to find. Our hotel, Suba Palace, is only a 15 minute walk away from Marine Drive. It would have to be morning walks. We set out just after a light breakfast. The big roundabout that makes the start of Colaba Causeway, S. P. Mukherjee Chowk, was still rather empty, we could cross the street in a civilised way…. And then we headed for Flora Fountain, along MG Road, through the charming Fort area, where we took a left turn and ended up on Veer Nariman Road that cuts through the Oval Maidan to the left and the Cross Maidan to the right! Or we chose the more quiet Madame Cama Road that would take us directly to Marine drive, through a pretty quiet neighbourhood. Many of the streets in the south of Mumbai are lined with beautiful trees that also cast very pleasant shadows. But we didn’t really need the shadows in the early morning. The air felt cool and fresh and we could walk pretty fast. It’s always interesting to see a big city come to life. And especially a megacity, like Mumbai. I guess this part of the south of Mumbai will never get really crowded and these streets will not be lined with hawkers during the day – still – they won’t remain empty. The rush hour had not really started, some cars were there – but you couldn’t really call it traffic. Mumbai traffic….The Air India building rose in front of us, and Marine Drive was “just around the corner”. 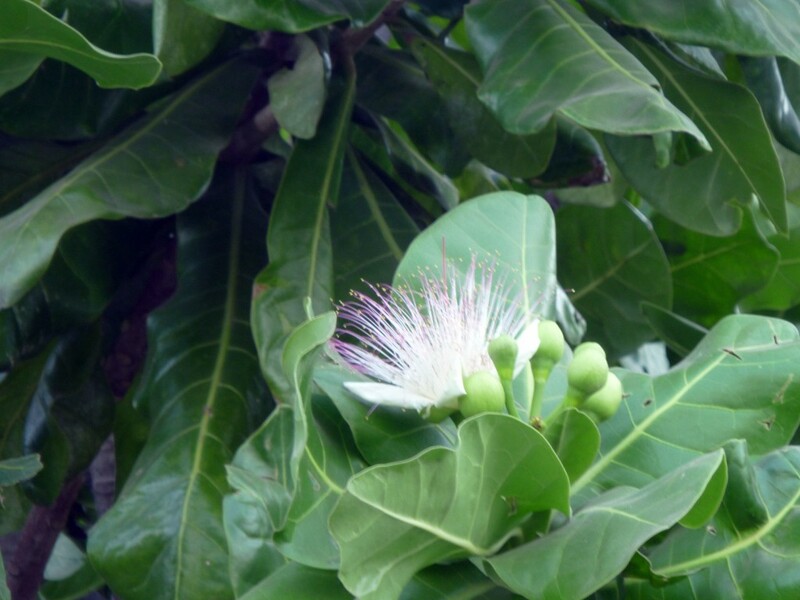 We passed a fantastic banyan tree, where we crossed the road and then: The Arabian Sea. 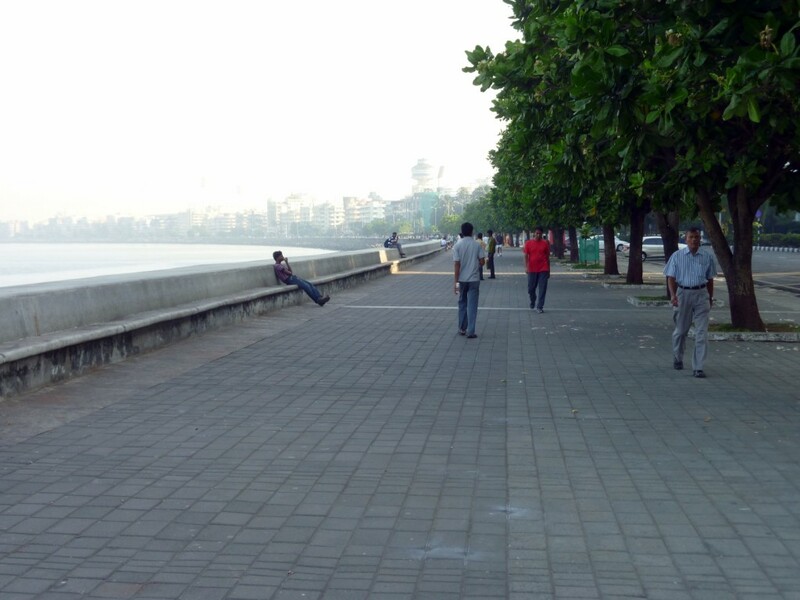 Marine Drive is a promenade, 3 kilometre long, and there is space for everybody on a Monday morning! People come here for a brisk walk (or just a walk), there are joggers, people do yoga and meditation, and contemplation. In a city of close to 18 million inhabitants, Marine Drive is a breathing space for many people – including an over heated tourist! We walked to the very start (south) of Marine Drive and turned around – going north. Every morning I had to comment on the Samudra, its lovely fragrance and the funny flowers. But then suddenly: The sun strikes back…. When you walk in the early morning, or in the pleasant shadow, it’s hard to imagine how the sun burns. So we crossed the Netaji S Bose Road (Marine Drive), now heavy with traffic, and walked towards Churcgate station. We wanted a coffee really badly, every morning, but it was just about too early for the coffe bars we passed on our way. We knew the Barista, or the Cafe CoffeDay, both next to Regal Cinema in Colaba would be open any minute. Both serve excellent coffee! The morning walk became a ritual. A ritual I will keep up as long as I visit Mumbai! 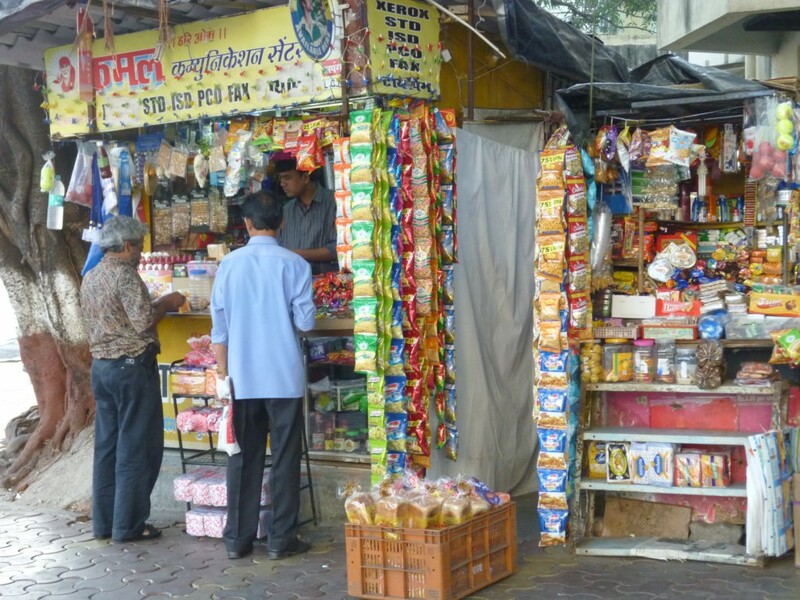 A corner shop comes to life in the morning…. 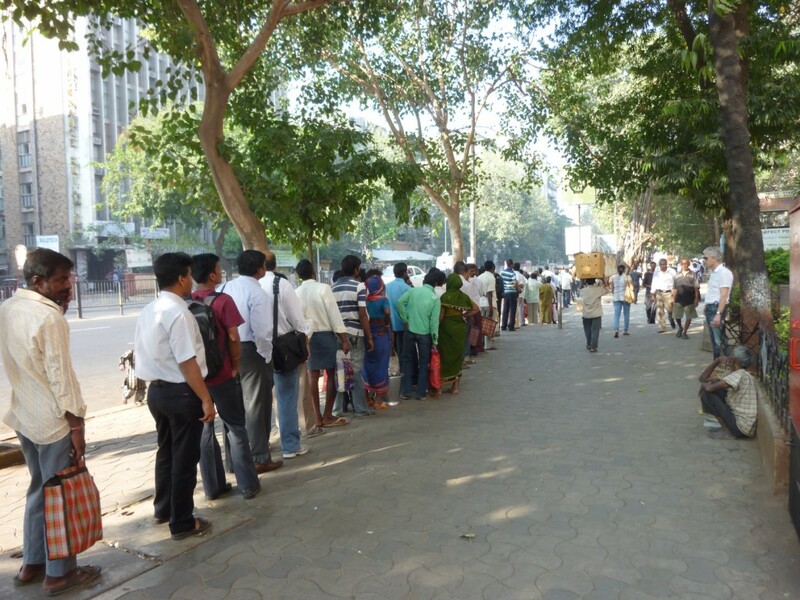 And the bus queues springs to life as well…. A man’s gotta do what a man’s gotta do…. as seen from our window at Barista! I was going through the photos from my last trip to India and came across four women I met in Cochin (state of Kerala) last November. Well women…., they were dolls on dispaly outside a shop; dressed in mauve, and they were absolutely gorgous. It was impossible to pass, and I felt the urge to go inside – in search of more treasures. I wanted to explain the young shop assistant that I came in because of the dolls – but it was a dead end…. 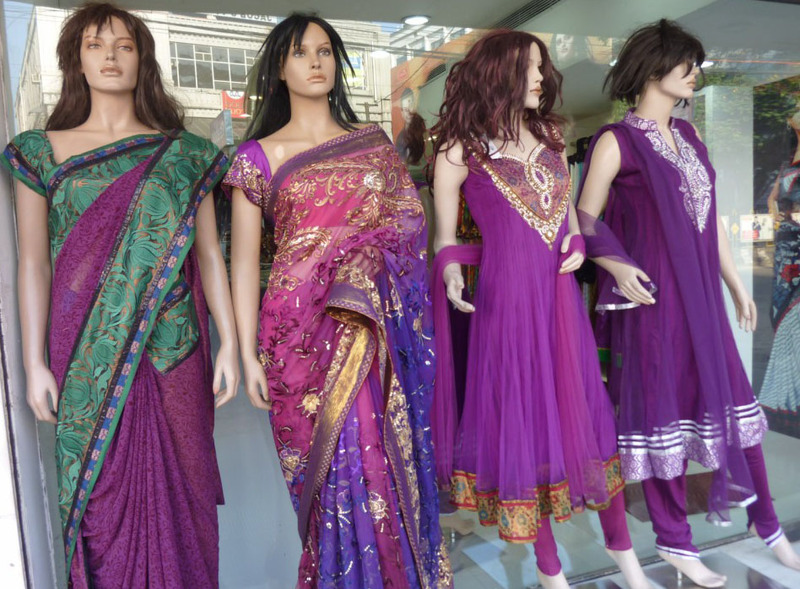 her English was poor and as much as I wanted to buy something to make her happy – I was going through “a million kurtas” – nothing could match the mauve creations outside. 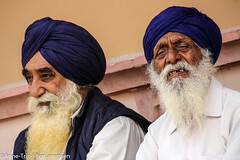 I could never wear colurs like these, and if I came home – wearing one of these outfits – well somebody would most definately have a fit. When buying clothes in India, one must always put on the homely specs and be sensible…. What looks awesome in India, most probably looks horribly out of place at home. But it’s not forbidden to watch and admire…. Colours have always been a reason, when people ask what it is about India that I like so much. 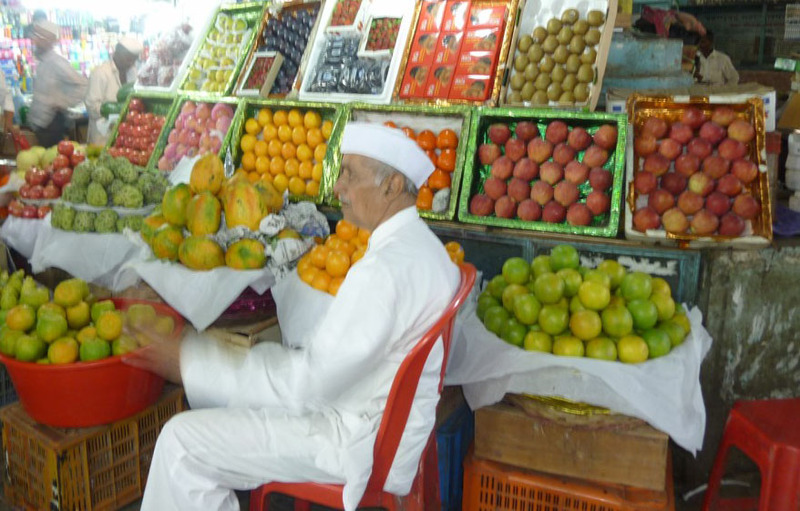 Colours are everywhere in India, in many senses and many ways. 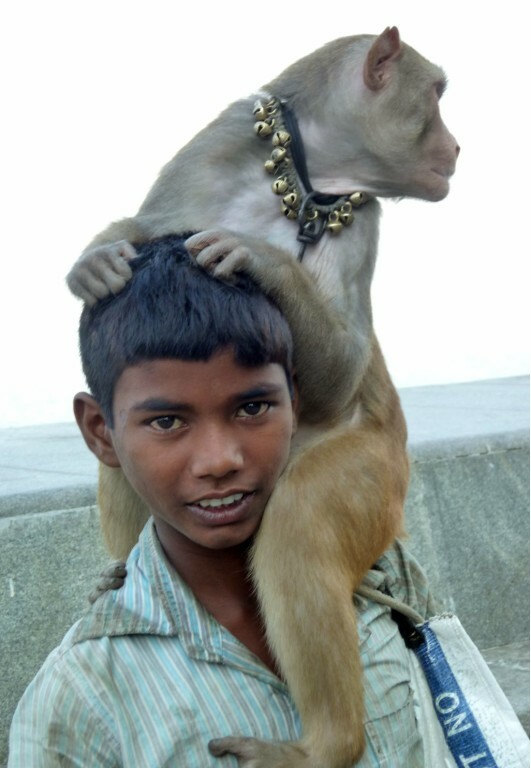 I remember a wedding that was taking place on a street in Mumbai, near the Mumba Devi temple. The couple was very poor, that was all too clear. But the bride was dressed in her red wedding dress and she stood out on the dusty, grey pavement. She looked like a queen. The red saree did it for her! Going through more photos, I found some from Crawford market in Mumbai. I like taking pictures of fruit and vegetables. It’s the colours, the shape , the way they are put on display… Like a piece of art! Or maybe is it music? I think of the seller as a conductor, with his symphony of colours! 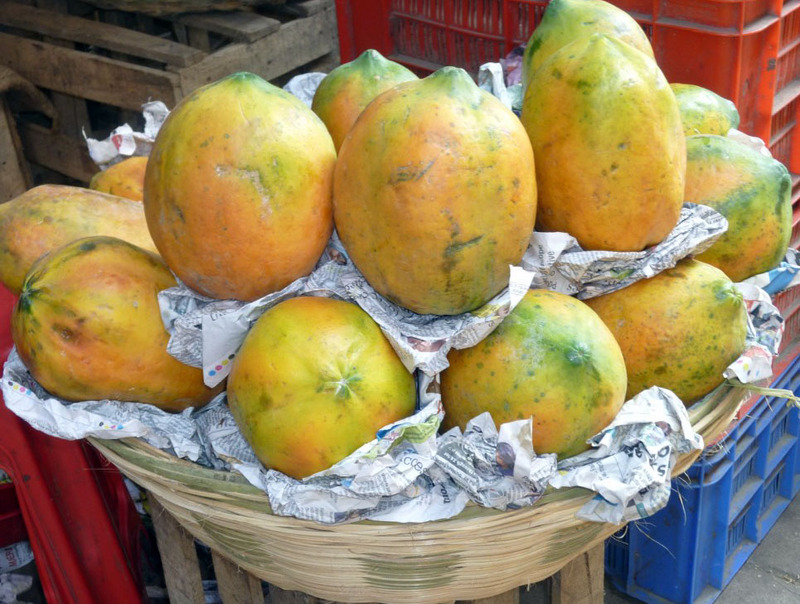 And here are some of the orange-green movement….